I had a conversation recently with someone who told me that blogging didn’t work. He’d been blogging for years and only saw moderate increases in traffic and little to no increase in leads generated as a result of blogging. His company had been blogging pretty consistently. There were occasional gaps in posting blogs, but his company certainly averaged more than a blog a week over an extended period of time. As a result of this conversation, I offered to review his blog to see if I could figure out why it wasn’t creating meaningful results. He agreed and after spending a little bit of time reviewing his company’s posts, I was quickly able to determine the root cause of the problem. The first problem was that while the blog posts were well written, they were all about them and their products. Don’t get me wrong, the posts weren’t advertisements in disguise. In their own way, they were quite educational. However, they were only educating people about their “what” and their “how,” which are bottom and (lower) middle, respectively, funnel items. The problem with this approach is that this type of content doesn’t give your buyer personas reasons to come back or to engage with you, unless they’ve already identified that they need whatever it is you do (and that’s a very small percentage of your influenceable market). Think about it, if you sell a supply chain planning system there is going to be a limited interest in the how and what of what makes your platform a superior choice. If this is the type of content you’re creating, then you’re not creating the type of content that drives new traffic and leads in a complex/high consideration B2B type sales opportunity. Now, if you’re selling pools, a basic copier, tax preparation and the like, then that type of blogging can work, because there is little to no demand creation opportunity and the sales cycle is highly defined and usually very short. While there are many reasons business should be blogging, driving top-of-funnel and search traffic is number one. To justify the cost of creating compelling blog content, you must be sure that you’re focused on creating and positioning the type of content to does just that. Little growth and no consistency in search-originated traffic (a major cause of this is that when you create this type of content it leads to the cannibalization of whatever search traffic you would create). Low social-originated traffic (a measure of how much people are sharing your content). The second problem was much easier to identify. There were no calls to action (CTAs) on their blog posts. I often see this with blogs. Great content, no call-to-action. When I see this, I feel so bad for the creator of the content. I know how hard creating content is, and when you don’t purposefully add CTAs to your blog posts you may as well be volunteering. Don’t get me wrong, I appreciate the knowledge share, but there’s not much benefit for the creator. Let’s be clear about this; blogs are a powerful medium to create awareness and influence, but they are not direct sales instruments. No one is going to read a blog and think, “Holy cow! This is great. I need to buy something from these people now!” You must make taking the next step and engaging further easy, valuable and obvious for them. While creating and publishing compelling content consistently is the most important focus for an effective blog, there are three actions you should be sure you’re focusing on to ensure you get the results worthy of the effort it takes to support a blog. Blogging is powerful precisely because it allows you to communicate directly with your market; you become the publisher. But like any publisher, you must establish a clear editorial philosophy that your reader (your buyer personas) find interesting and valuable. A basic principle to keep in the front of your mind is that prospects don’t care about you or your products/services. What they do care about is themselves, the problems they’re trying to solve and the results they’re trying to attain. The primary focus of your blog content should be focused on teaching (and helping) them address those issues – even if those issues are not fully or directly addressed by your product/service. So to use the supply chain example again, your blog should address topics around managing costs, addressing efficiencies and other items that dominate the day of your personas. Taking this approach is crucial to creating top of funnel traffic and for framing the real impact of your proposition as it connects what you do to the important issues impacting your prospects. While blogging certainly has middle funnel value, its focus is at the beginning of the demand generation process. This means that you should be focused on establishing thought leadership around the results you create and introduce the real problem (your why) you are trying to solve. Consider this, by the time someone is searching for “supply chain software” (or whatever your offering is) they’re already in a funnel. By the time a prospect searches those keywords, they’re past the awareness phase and are already in consideration; meaning you’ve lost a key opportunity to influence how they define their problem. To attract traffic at the top of your funnel, you must focus on what your personas are searching for before they’ve identified that they have the problem that you solve. Your goal in creating blog content is to build structural tension. This happens when there is clear conflict between the result one desires and how one defines their present circumstance. As I mentioned in the first tip, this means that oftentimes the best thing you can write about is not always directly connected to your product/service. Here are a couple of examples of how we do this at Imagine. We often write about key metrics that you should be tracking to assess effective revenue and demand generation. By getting people to think about these measurements, we create greater clarity to the presence and impact of the problems that are associated with their present approach. Recently, we released a workbook on how to create an effective sales and marketing service level agreement (SLA). Additionally, we’ve written several blog posts on the topic. Nowhere in the workbook or blog posts do we talk about our services and while we create SLAs as a part of our execution engagements, you could not hire us simply to create one. The entire focus of the content is to teach our personas how to create their own. We know that if they take the step of creating an SLA (or assessing the one they have) that it will most likely create more pain as they realize the difficulties and complexities of creating an effective SLA, while also gaining deeper understanding of the importance of an SLA. Using our supply chain software as an example. If they were to write content that provided insights into how companies can gain greater control of their cost structure without degrading performance, they would create the structural tension that increases the likelihood that their prospects would acknowledge the need for different, better supply chain software. While the focus of this post has been on the importance of writing to the top of the demand generation funnel, I’m not inferring that middle and bottom of funnel content isn’t important. The question isn’t should you write such content, but rather how much of your blog content should be dedicated to such content. 60 – 70% of your content should be aimed above and at the top of your funnel. 20 – 30% of your content should be aimed in the middle of the funnel, focused on consideration issues. 10 – 20% of your content should be aimed to the bottom of the funnel, focused on how your solutions differ from your competitors. There is one exception to this rule. For some companies, an important persona possesses significant technical expertise in the areas you impact. In this case, you should write more blog-type content that is typically defined as middle or bottom funnel focused. However, the adjustment you should make here is to create a dedicated blog to focus such content – a blog for experts, written by experts. This is an instance where a multi-blog strategy makes sense. Don’t create the technical blog at the expense of a more general blog that I describe here. There are a lot of advantages to a multi-blog strategy even though it does take more effort. 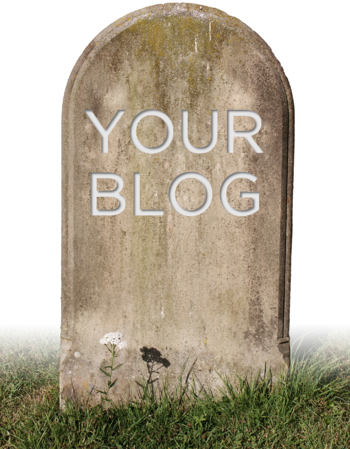 Blogging is a powerful tactic, one of the most powerful for any demand generation effort. Follow these simple tips and you’ll see your blog efforts pay off.